What does it mean to be a character? What does it mean to be a person? How many lives can one person live? 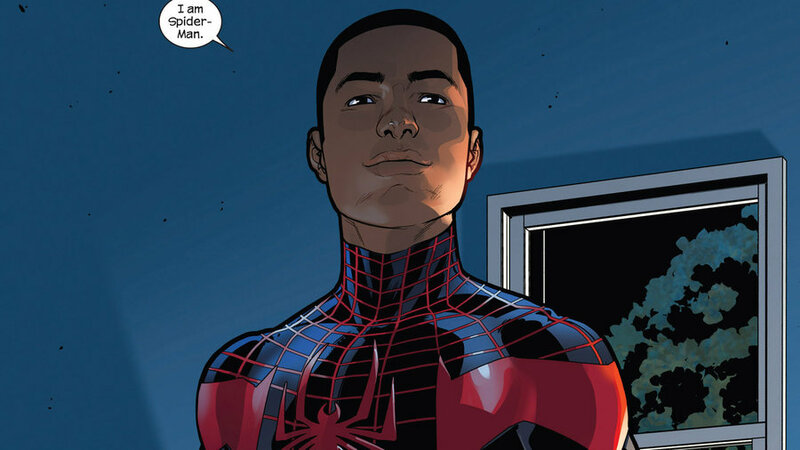 How can Spider-Man be black? The answers to all of these questions usually mix together and boil down to two key principles of story-telling: the speaker and the audience; or, what the story means to the person telling it and who they are shaping it for. Perhaps they change certain important aspects of the story and yet keep others. Maybe a character changes gender or the setting is shifted a thousand years. It is very rare for a story and all its details to stay enduringly unique forever – which is why modernized Shakespeare plays are the norm and why in the current Marvel canon, the man under the Spider-Man mask is Miles Morales – an outcast black teen from New York – following Peter Parker’s death in past issues. One explanation is simply that the next man to receive Spidey’s superpowers just happened to be of African-American descent; a coincidence. But nothing in storytelling is a coincidence. So, the other explanation is that the story of Spider-Man, a nerdy teen who didn’t fit in from New York (a city which is 30% Black), resonates with young African-Americans and tells a story which makes sense and inspires a demographic who doesn’t typically get to see themselves represented by super heroes. A classic story of heroics and redemption is taken and reworked when a new storyteller took up the pen and a new audience was designated as the listeners. The exact same mechanic is at work amid all 5 stories of Antigone Project, as 5 different playwrights take the basic framework of the ancient Greek story Antigone and dissect it, scrutinizing it’s details and fitting them into a fresh skin with new words and characters but the same few strands of truth present in all of them. In Tanya Barfield’s Medallion, Antigone is embodied in Antoinette, a young African-American woman demanding she receive the purple heart she believes is owed to her deceased brother from Carlton (Creon), who tells her she “oversteps herself” with her requests. It is a story of civil disobedience and rightful burial just as Sophocles’ 2500 year old play is and the same resonant strands are present, but it is a new tale told by a new teller and for a new audience. It is not a rendition, nor it is an homage, but a retelling – allowing Antigone and her fight to breathe in the air of 1918 and show how different times are … or, exactly the same. All 5 playwrights within Antigone Project offer their own personal reworking of Antigone and her struggle while mixing in their own intimate impressions of the ancient woman they write about. Sometimes it is startlingly different, sometimes entirely familiar. It all depends on who tells the story and who they tell it for.